In Quebec's tiny fishing village of Sainte Marie La Mauderne, things are looking grim. Since the fishing industry dried up the subsistence of the town has relied on a humiliating collection of welfare cheques. Hope arrives in the form of a plastics factory. There's just one catch: to build a factory you need an onsite doctor and Sainte-Marie-La-Mauderne is fresh out. Seducing Dr. Lewis, director Jean-François Pouliot's first attempt at a feature, won an audience award at 2004's Sundance Film Festival and brought in big box office figures in Quebec. Also known as La Grande Séduction, for those not in need of English subtitles, its strong sexual theme, particularly in the opening and closing of the film, would have been less out of place had the title stuck more closely to the original French translation: The Big Seduction. But in this film, all seducing efforts are focused on attracting a big town doctor to small town Sainte Marie. Think Doc Hollywood. 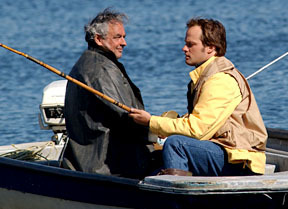 Raymond Bouchard stars as Germain Lesage, a desperate villager bent on winning over fast-living Montreal plastic surgeon Christopher Lewis (the duo-tone-eyed David Boutin).